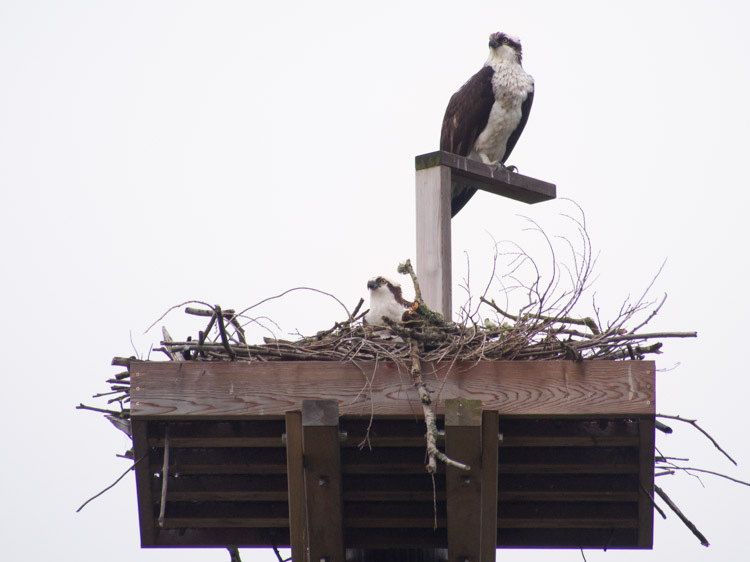 Four of our six Seattle neighborhood Ospreys returned last week from the long haul of their migration. If you haven’t seen the tracking maps showing Osprey travel routes, take a look at this website: Osprey migration maps. For these studies, Ospreys are fitted with light satellite transmitters that fall off after two to three years. In the time before the Ospreys lose the transmitter, researchers gather data about their final destinations and their various stops along the way. Our Seattle Ospreys aren’t wearing transmitters so I don’t know precisely where they migrated or wintered this year — Mexico or Central America or beyond. But, I do know they endured hardship to be with us again … to follow the trail and call of all Ospreys who came before, and to indulge the drives that bring them homeward to raise their young. Be well, my winged friends. We’ll look out for you while you’re here. My second photo shot on a rainy day, with the female looking on as the male arranges sticks in the nest below. It’s great you have them available. I remember my frustration in Central Florida trying to photograph them and not being able to get close. It was an area full of lakes so apparently they had more nesting areas there. The also caught very big prey so they tended to retreat in hidden areas I didn’t have access to. That video is amazing. Maria, I know what you mean because I didn’t have any such access in California. One of the platforms here is in a public park that’s quite popular in the summer, even though I’m still careful not to stay too long and point my camera at the nest. I have a few spots where I can take shots without being obtrusive. I have similar emotions to yours regarding the return of migrating birds, Ingrid. We don’t have many Osprey but for me the species that really makes me think about the challenges of migration are the Swainson’s Hawks that are just now returning from South America. Such an impressive and perilous journey! I quite enjoyed the clip. Ron, “impressive and perilous” is precisely what it is! Perfect description. It’s funny, CQ, I often wondered if being exposed to so much death in the context of the wild, would harden me the way it does some. I’ve found the opposite to be true: I feel even more poignantly the repercussions they endure. I think the more you become aware, the more difficult it is to compartmentalize the struggles of the “other.” But, the awareness has to involve understanding “who” they are, not just “what” they are in terms of conservation figures. It’s the “who” part that drives genuine caring, in my mind. Yes, Ingrid. And the “who” part makes them seem less and less like “other” and more and more like “us” — all of us deserving of equal respect, consideration, justice, and compassion. Hi, Stella, and thanks for the comment! 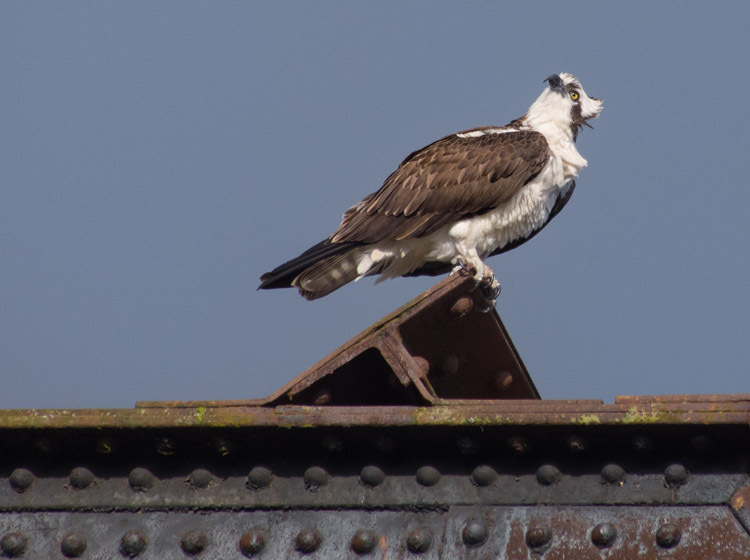 Yes, the Ballard Ospreys are wonderful to observe, I agree. Do you live in the neighborhood? The various local Osprey couples started coming back around the first of April, so two things are probably happening when you look for them: 1) One of the pair is out fishing, and 2) The second of the pair is likely incubating eggs. They hunker down flat on the nest while incubating, so they’re difficult to see in that pose.